In the previous post, I presented the pixel composition feature in Pico Pixel. In this post, I introduce the pixel compositor interface and how it is managed. At the core, a pixel composition is a set of pixel shaders running sequentially over a quad polygon. Execution of a single pixel shader produces an output that can be used as a source texture in the subsequent pixel shaders execution. 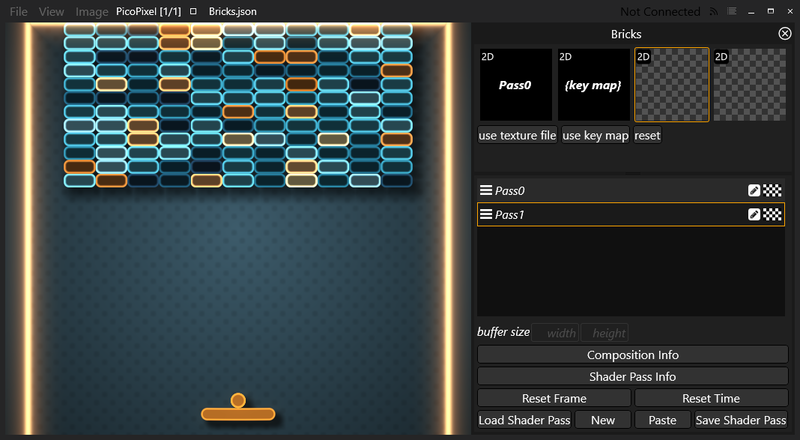 The output of the last pixel shader is displayed as a texture in Pico Pixel. Although the pixel compositor user interface is still a work in progress, you can see the stack of pixel shaders in the panel on the right side. The pixel compositor interface may be hidden so that the output image uses the entire window space. Each shader layer has 4 inputs. An input may be a texture file (2D, 3D and Cubemap textures are supported), the keyboard texture map or the output of another pixel shader layer. In the next post, more info on how to get your shaders in the pixel compositor. All content copyright Pixel & Polygon © 2019 • All rights reserved.